The house is situated directly by the National Park Plitvice Lakes, in village Smoljanac, in the heart of beautiful … More » nature. Ideal for quiet recreation. We offer apartments and rooms. 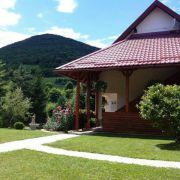 Apartment for 5 persons, apartment for 4 persons, double room and three-beds room with shared bathroom.